We all know this story about the “sinful” woman who bathes Jesus’ feet while He was dining at a Pharisee’s home. The woman cannot stop kissing His feet because she was so incredibly sinful yet Jesus forgives her sins. We almost read this and think it would be better to have some terrible lifestyle to come out of, so we can love Jesus all the more. This should not be so! The Pharisee could have been said to have been just as great a sinner as this woman. The Bible records many rebukes Jesus made to the Pharisees – the blind leading the blind and white-washed tombs coming to mind. Jesus tells the story of the Pharisee and the Tax Collector (Luke 18:9-14). Both went to the temple to pray. The tax collector confesses his sins; the Pharisee thanks God he is not like the tax collector. One one went home justified before God. It is not that one was more sinful before God. It wasn’t that one needed more to be forgiven. Both had their issues, but only one was forgiven. 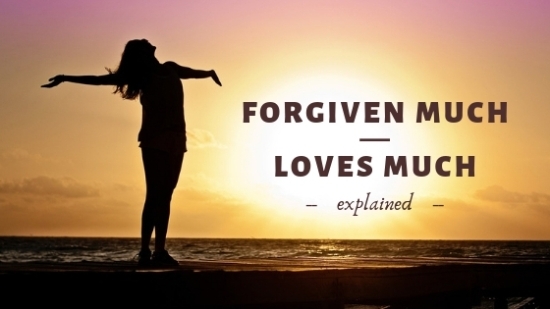 The purpose of Jesus’ statement about those who have been forgiven much, love much is not that they had more to be forgiven. We are all sinful apart from God. On our own, we will remain His enemies, going our own way. The Pharisees had their rules to follow, and from what they could tell, they were good at following them. They reason that they had their quiet each day, gave their tithes, didn’t get drunk or fool around. They were doing a good job being Godly. Being unaware of their real need of God, they were not loving to people who realized theirs. Confession is not meant to make ourselves feel like crap. We confess to remind ourselves how everything we have received from God is a gift. Nothing has been earned by our good behavior. By doing this, we have compassion on those around us because that free gift is available to them as well. Why is Loving Others a Mark of Loving God? I realized I had asked the questions about how can we love God more, and I answered about how to love others. Loving others is a mark of loving God because 1. He commands us to love others, and 2. by loving others we are loving what God loves. I believe this is a great guide to check the health of your connection with God. To freely love others means we remove all judgement of them and attempt to see them as God sees them. In both stories above, the Pharisees judged the tax collector and woman. They got their focus off of God and sought to make themselves feel better by thinking how much better they were. So, when Jesus says that those who have been forgiven much, love much, He is not saying those who have come from the worst lifestyles. We all need God. Those who are more aware of their need, will be all the more grateful and loving to God. There is a fear of continuing to focus on all those things that need to be confessed to God that we will get to the point of running out of His forgiveness. To be honest, that is the point. Every time we go to God for forgiveness, we will find it. He loves you with a never-ending love. Nothing you have ever done or will ever do will stop Him from loving you. The only thing that will keep you from His forgiveness is if you don’t ask for it. On our own, we don’t like to think about our need for God. We want to do things that would make God happy that we are Christians. Doing good is not a bad thing and should be natural for us now as Christians, but we need daily reminders that we still need God and His Holy Spirit.